The winners of the Cycle Planning Awards 2016 were announced at Glaziers Hall, Southwark in London last week. 90 entries had been submitted for the second annual staging of the awards, which are organised by Landor Links. The chair of the judging panel was Philip Darnton OBE, executive director of the Bicycle Association. Other members of the panel were: Dr Rachel Aldred, senior lecturer in transport at Westminster University; Brian Deegan, Principal Technical Planner, Transport for London; Will Haynes, head of built Environment at Sustrans; Sharon Goodsell, head of Cycling & walking policy at the Department for Transport; Roger Geffen MBE, campaigns director at Cycling UK; and Martin Key, campaigns manager at British Cycling. The winners were announced by Andrew Gilligan, the Mayor of London’s former cycling csar. The category which attracted the most entries was for Best Innovation – Use of Technology or New Technique. 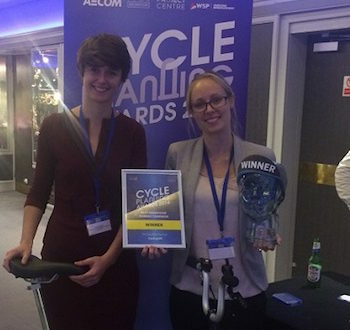 The award, sponsored by AECOM, went to CycleStreets Ltd, which provides data to a wide range of journey planning websites and apps across all major platforms. The data helps journey planning apps take into account road conditions, elevations, cycle infrastructure availability, and turn delays at every junction/crossing. CycleStreets says it provides “ready-to-use, customisable and embeddable solutions to local authorities”. For the second year running, The London Borough of Waltham Forest gained recognition for its efforts to make streets more pedestrian and cyclist friendly. The council took the Best Cycling Network Strategy or Masterplan award for its Mini-Holland programme. The judges decided that, in alignment with the ‘Mayor’s Vision for Cycling in London’, Waltham Forest has engaged with local needs to develop a clear vision for encouraging people to ‘take to two wheels’. 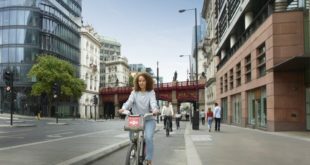 The council, which received a £27m from Transport for London for the improvements, said the Mini-Holland programme will increase cycling in the borough, making it an attractive mode of transport. The council believes its measures, which include installing segregated and semi-segregated cycle routes and closing roads to through traffic, will shift a significant proportion of short local car trips to the cycle. 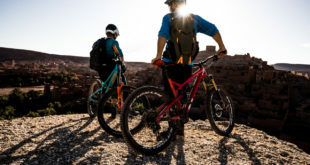 The changes will also improve the look and feel of public spaces, stimulate economic regeneration and improve actual and perceived safety for cyclists and encourage physical activity, says the council. The Best Cycle Network Infrastructure award, sponsored by WSP Parsons Brinckerhoff, went to Transport for London. Alongside the four Cycle Superhighways completed by TfL between 2010 – 2011, an additional 30km of major routes instalments were completed recently. There are now 18km of segregated or semi-segregated cycle lanes. The improvements includes low level signaling, 40 facilities that allow cyclists to bypass buses at bus stops, complete separation from traffic at 50 junctions and 23 new pedestrian crossings. This has resulted in an additional 3,800 cyclists commuting in the morning peak each day, estimates TfL. TfL says the routes were implemented with extensive public consultation. The Best Behaviour Change Campaign award, sponsored by Brompton Bike Hire, was won by Cycling UK for the Big Bike Revival. The campaign was launched to encourage people who own bikes but do not cycle, or cycle less than once a week, to start cycling. Cycling UK says that in 2015, nearly 32,000 people attended over 1,600 events across the two weeks, resulting in 24,000 bikes being revived. Survey data showed that people who got involved were inspired and empowered to cycle more, says Cycling UK. The Scottish Government has also announced funding for the Big Bike Revival over autumn 2016. The Most Cycle Friendly Workplace Award went to Next Plc’s ‘Where Will You Cycle to Next?’ Initiative. Next began promoting sustainable travel to its workers in 2014. The company says that, at that time, only 24 employees cycled to its head office. Thanks to the initiative, this has now grown to more than 100 who cycle either daily or occasionally. Next hopes to see another 30 employees making the transition to bike commutes by the end of 2017. Coca-Cola Belfast Bikes were winners of the Best Integrated Community Hub award. Phase one of the bike hire scheme was launched by Belfast City Council in April 2015. The scheme now has more than 4,000 annual members, says the council. An annual subscription costs £20 or a three-day hire costs £5. Phase 2 of the scheme is now underway, with an additional new stations due to be delivered in 2016, bringing the total to 42. The ‘Most Cycle-friendly Policies Promoted by Local Government’ prize was awarded to Cambridgeshire County Council. The authority says it has worked with a number of partners to establish funding and an expert team to “deliver a number of cycling interventions in Cambridge”. This has resulted in a rise in cycling’s modal share from 18% in 2008 to 25% in 2015, the council says. It has set the target of cycling reaching 40% by 2023. Cambridgeshire says it was among the first to deploy no entry except cycles, early start signals, stepped cycle tracks with their own ‘Cambridge kerb’. 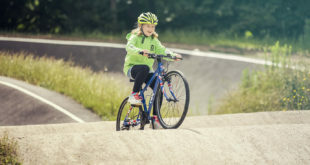 They have also worked with the local rail operator to develop the UK’s largest cycle hub which offers safe and secure parking for 3,000 bikes. The council says it is consulting on what could be the first truly Dutch type roundabout in the UK. Cycling Champion of the Year 2016 was TfL’s Michael Barratt. The judges felt that Barratt had consistently proven himself a true champion for cycling. “He has gone over and above the call of duty to improve road safety and specifically for more vulnerable road users, time and time again,” said Gilligan. The loudest applause of the evening came when 89-year-old Alistair Hanton was presented with a Lifetime Achievement Award. Gilligan said that Hanton was a “shining example of community leadership” who had started actively campaigning for cycling 40 years ago. Twenty years ago he pioneered the idea of making use of the route around the back of the New Den in east London, which has now been opened as part of Quietway 1. Hanton has been a “strong campaigner for direct vision lorries, which are now designed for use in London, as well as a member of the Pedestrian’s Association for many years before it became Living Streets”, said Gilligan.